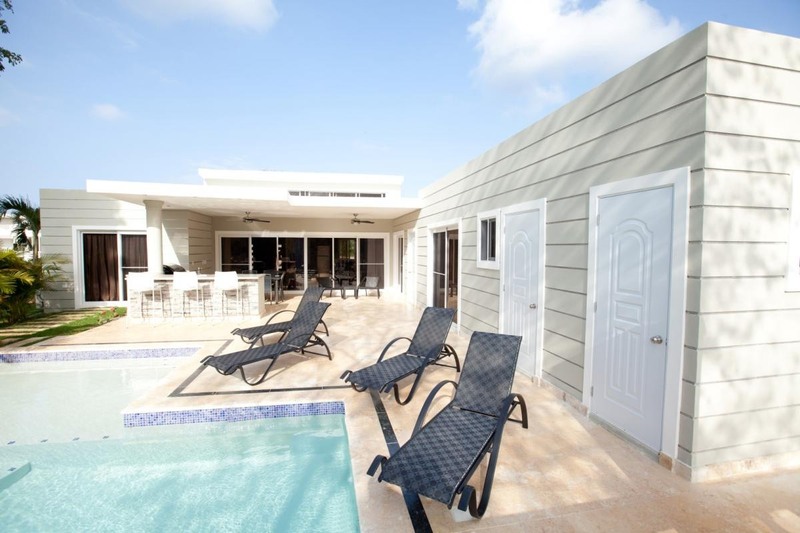 While most villa rentals in Sosua exude classic architectural styles, this 3 bedroom proves that modernism can go beyond the ordinary. 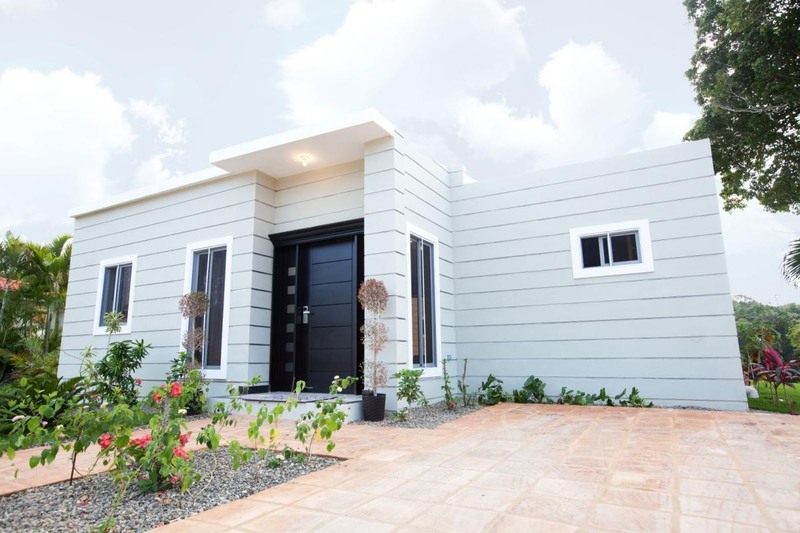 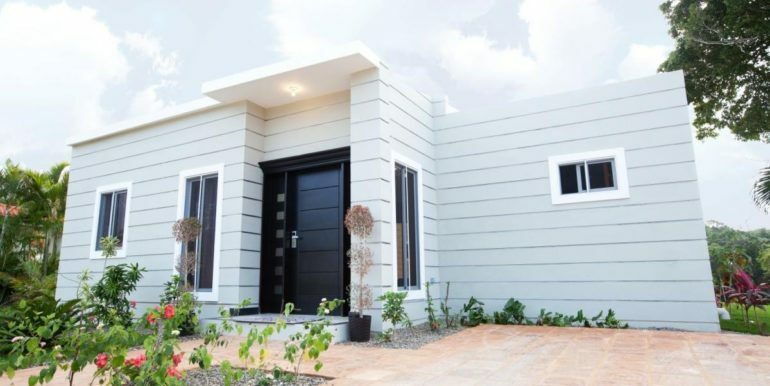 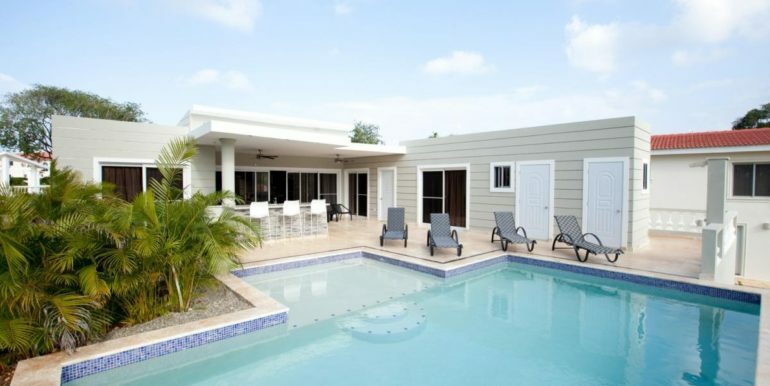 Built on one floor, the villa exterior exhibits bold lines along the facade, painted neutral sand color with white framed doors and windows; a single Doric pillar holds the floating roof over the pool terrace and outdoor bar / BBQ kitchen area. 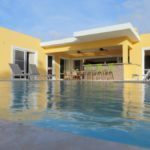 The swimming pool is entered via a shallow ledge that gives way to its submerged steps and opens to a pleasant coral-stone rimmed experience in your own private spa sipping a Piña Colada. 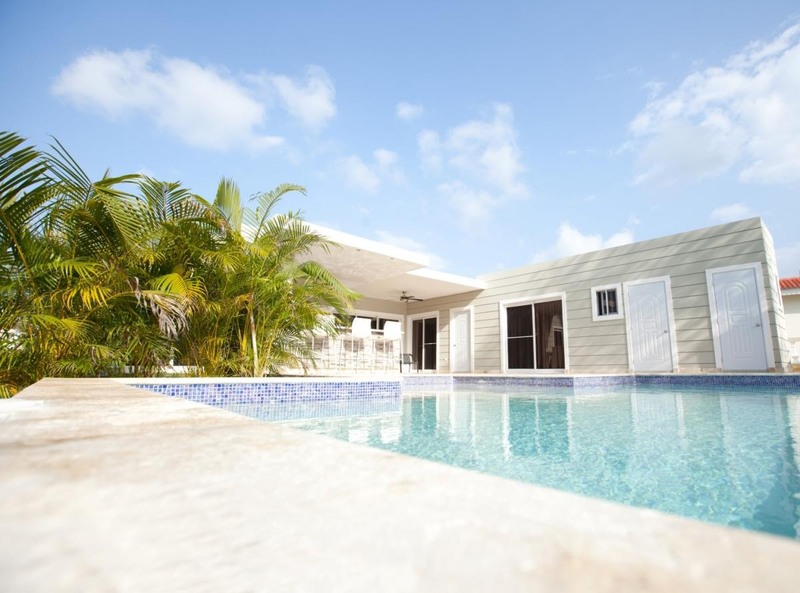 Tropical palms are set on the right side of the pool, where a garden area is the added contrast to the structure. 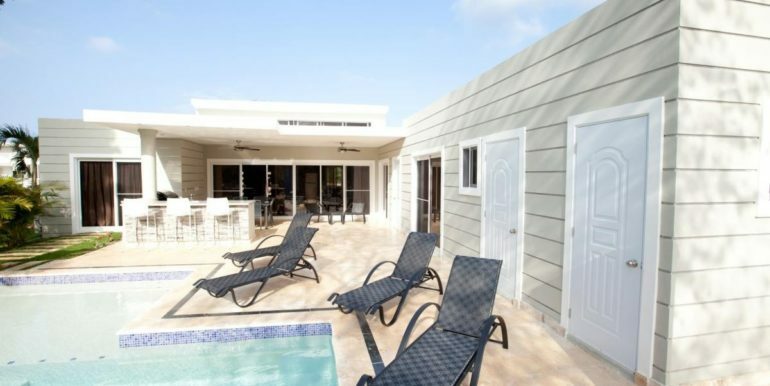 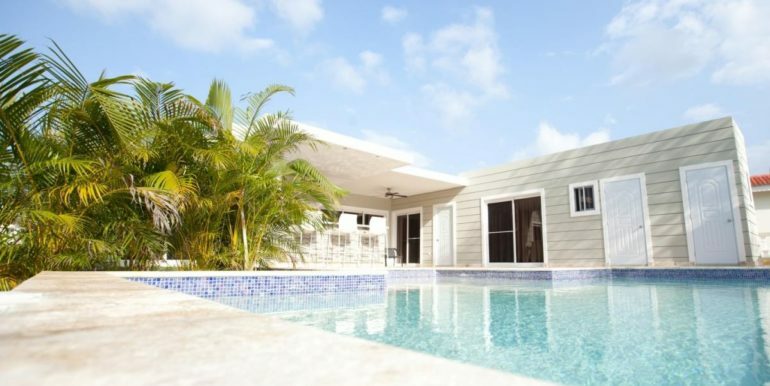 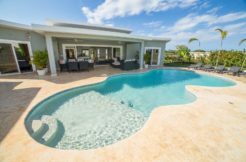 The covered terrace has patio furniture to enjoy breakfast by the pool, cook in the BBQ or enjoy a drink with friends sitting in the white high chairs; because there`s also pleasure in the shade when the sun shines in the Caribbean. 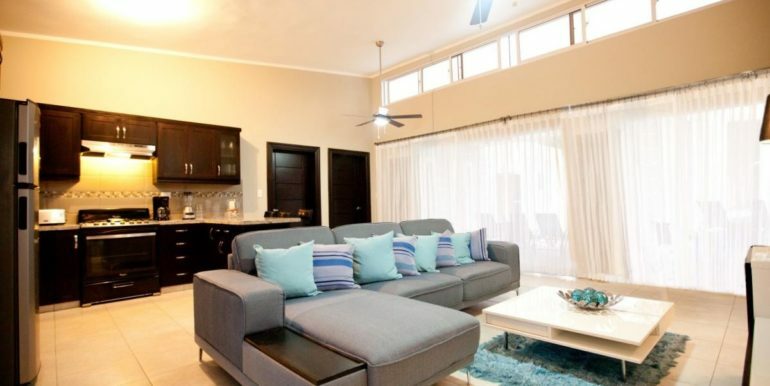 Inside the villa, the living room has a glass wall built of tall sliding doors, so guests can roll the curtains and bring the outside views to the inside. 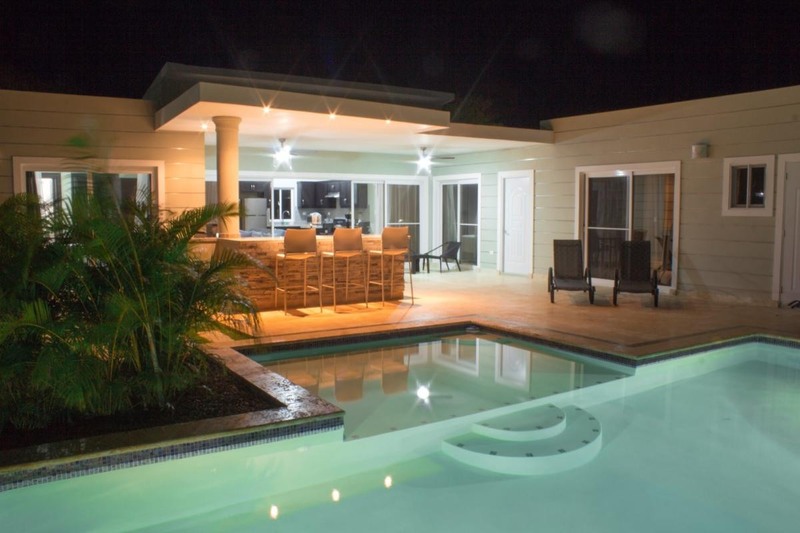 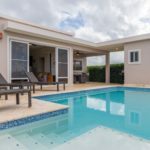 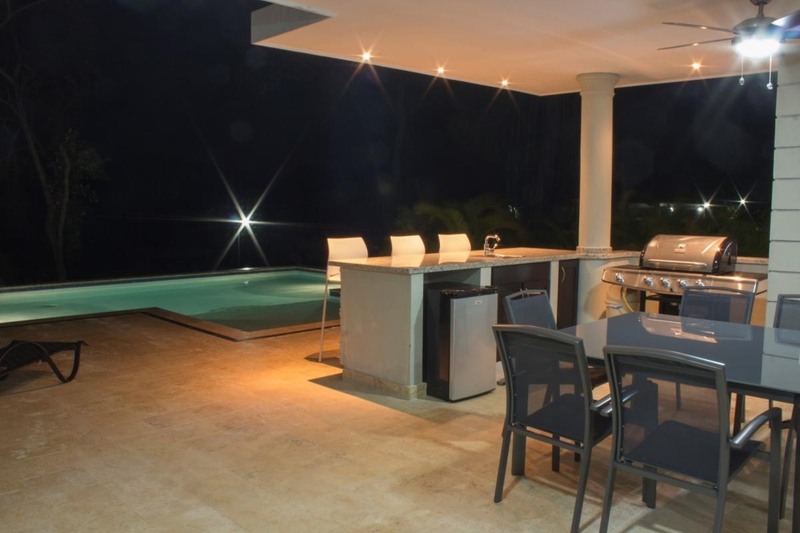 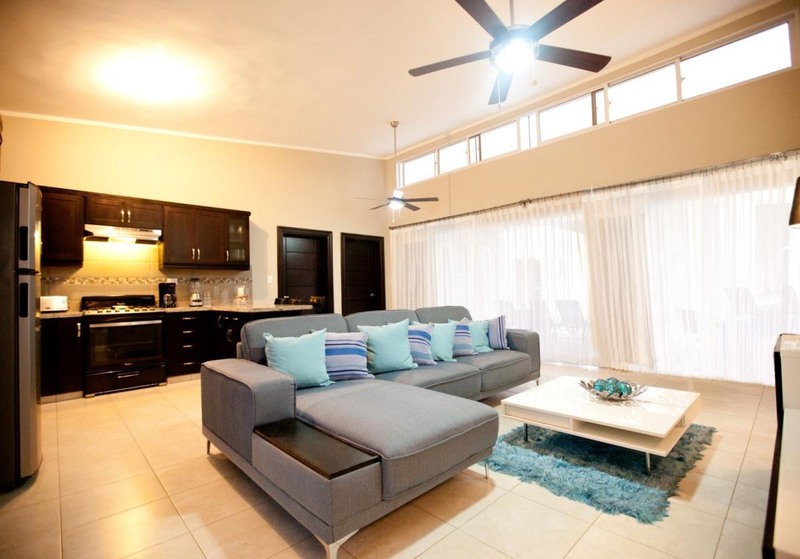 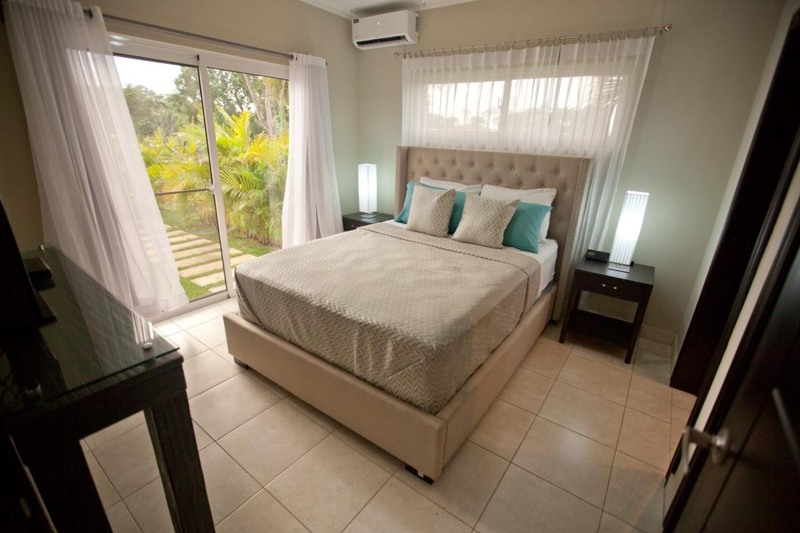 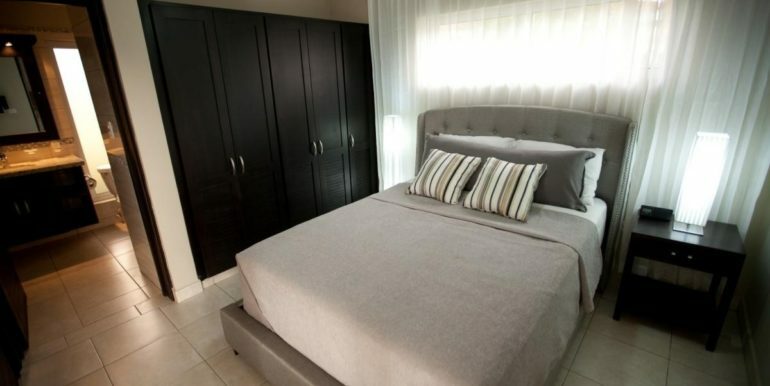 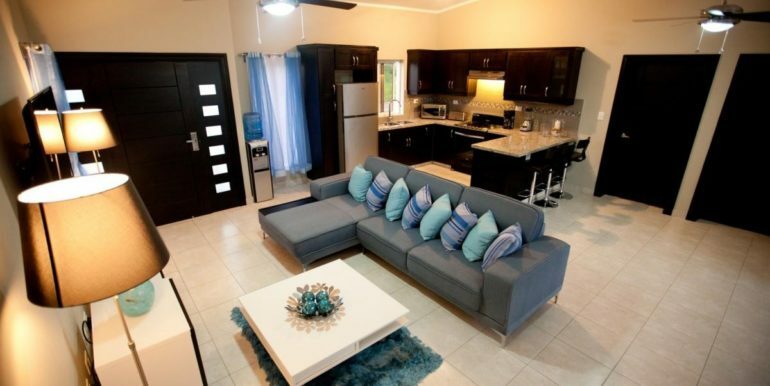 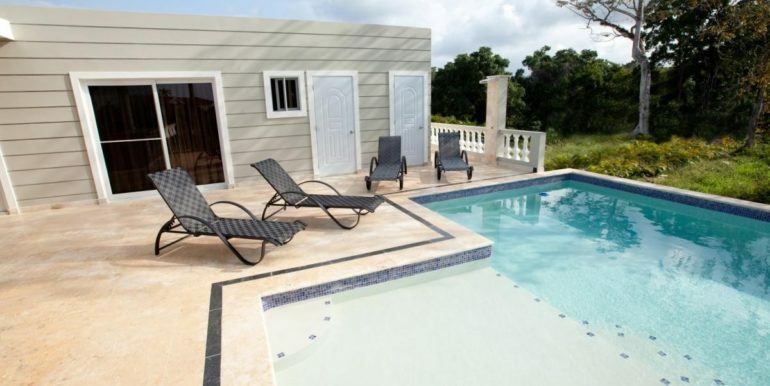 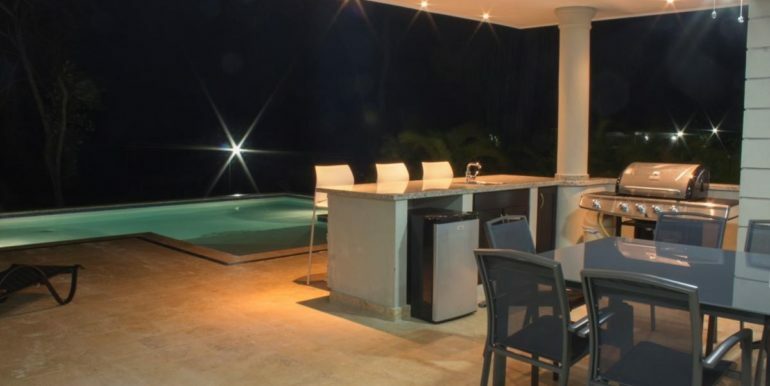 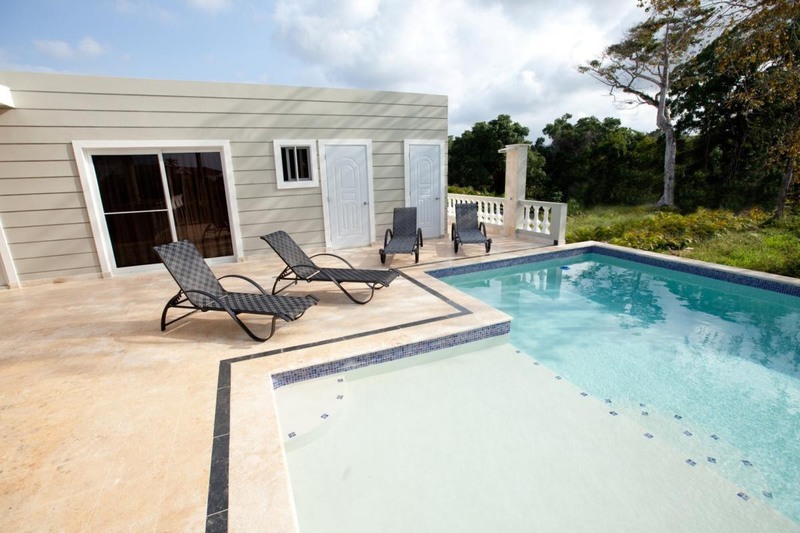 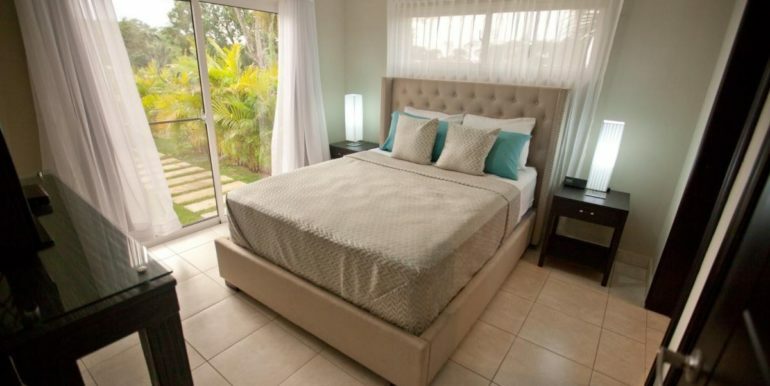 This Holiday Vacationing Sosua Villa Gated Community rental has been designed as a personal resort for its guests, to promote a totally laid back lifestyle. 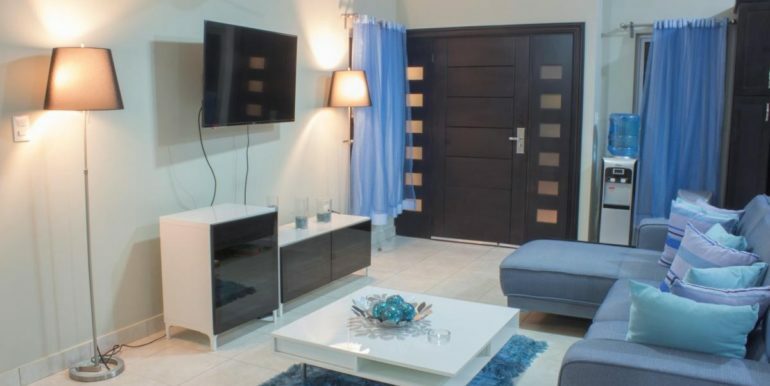 The plush, gray-tone L sofa facing the media area can`t get any better, placed almost at the center of the living room. 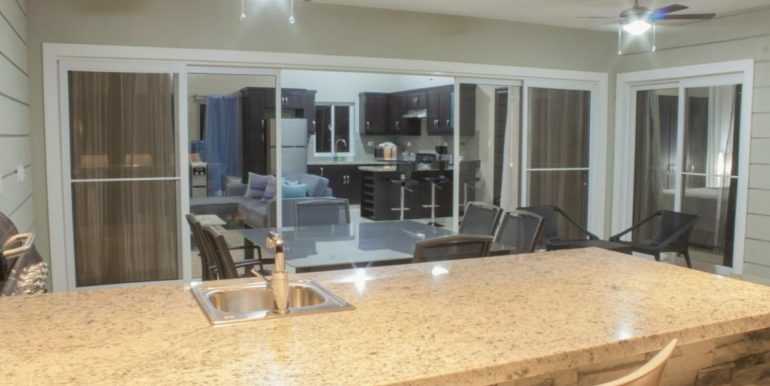 The kitchen is on the right side, elegant dark wood with granite top and overhead lighting, impossibly nice. 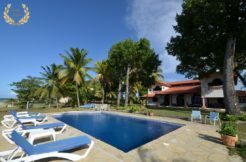 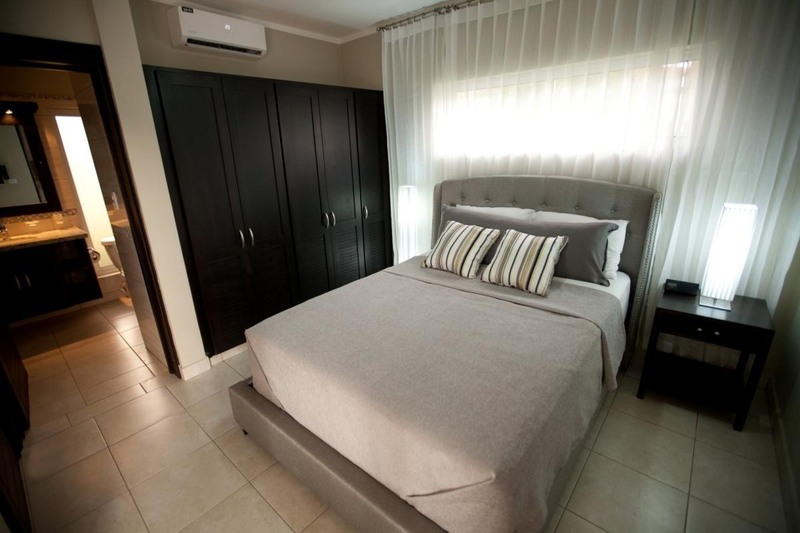 The bedrooms in the villa are all the same standard offered by Golden Treasures in this community, very well appointed with A/C, side lamps, fine bed sets, ceiling fans and decorative motifs worth the best photography we can afford. 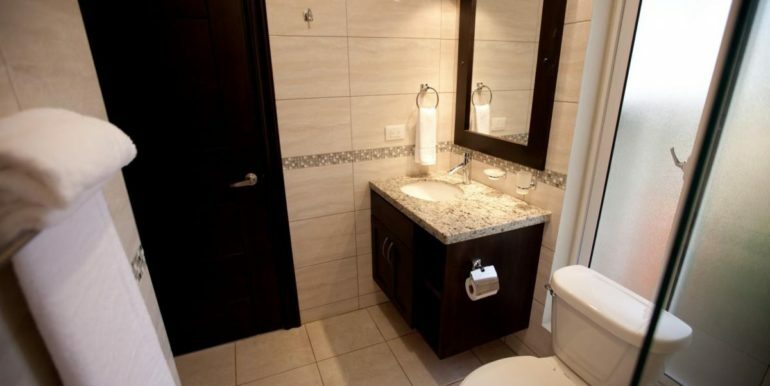 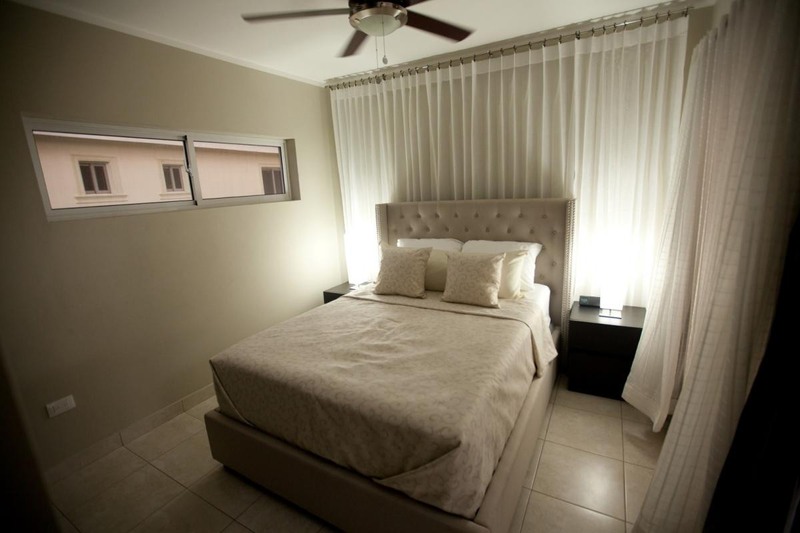 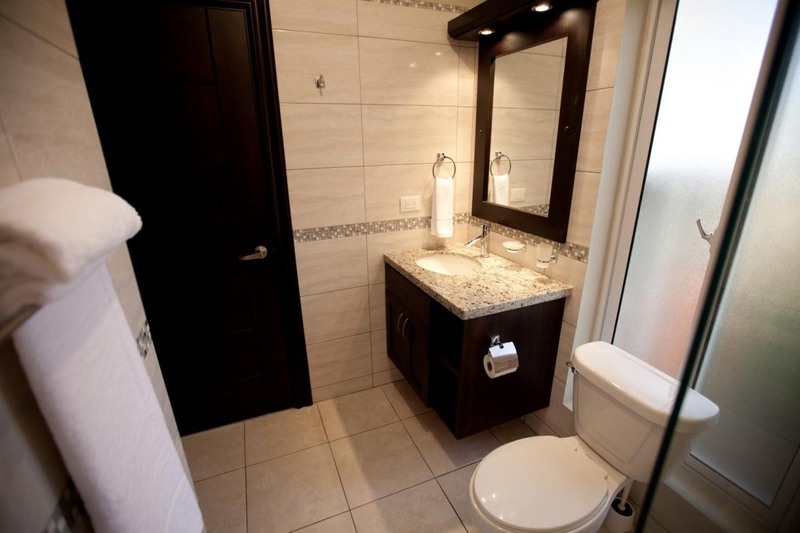 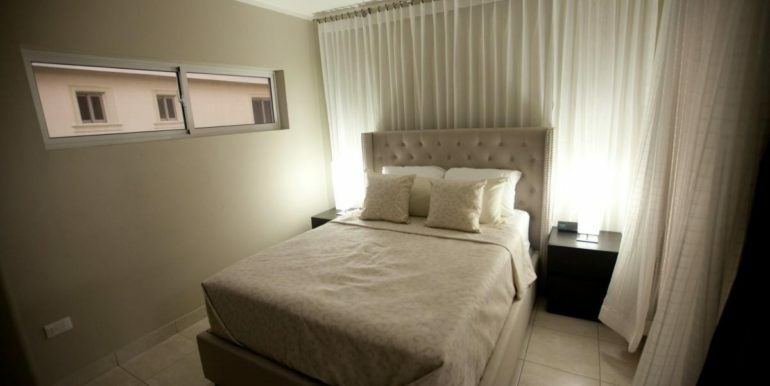 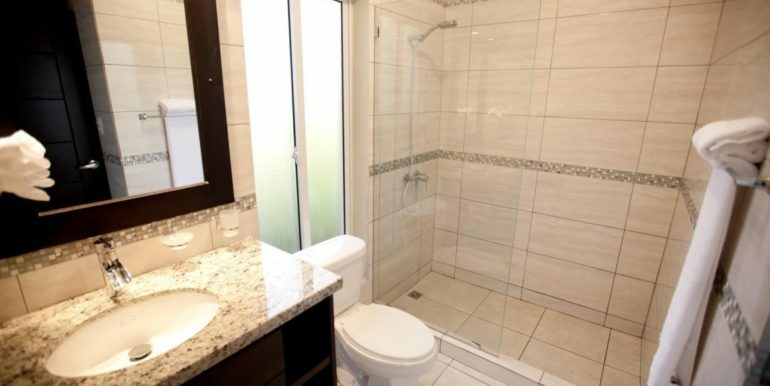 Each suite is paired with their own designer bathroom in light tones, imported ceramic tiles with trimming and dark wood cabinets so aesthetics follow form and function in the entire interiors. 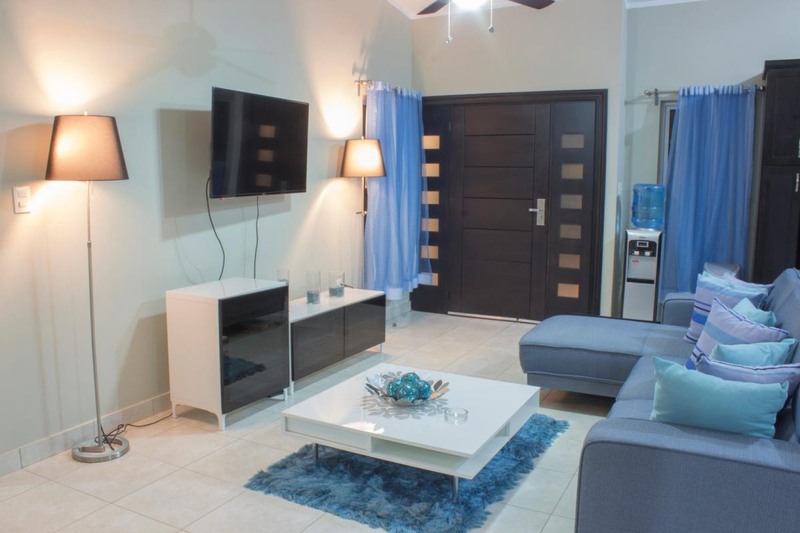 Blue curtain accents, cushions and carpets add the exquisite charming, high tone of this melodic, if not idyllic valhalla for the senses of a villa in Sosua. 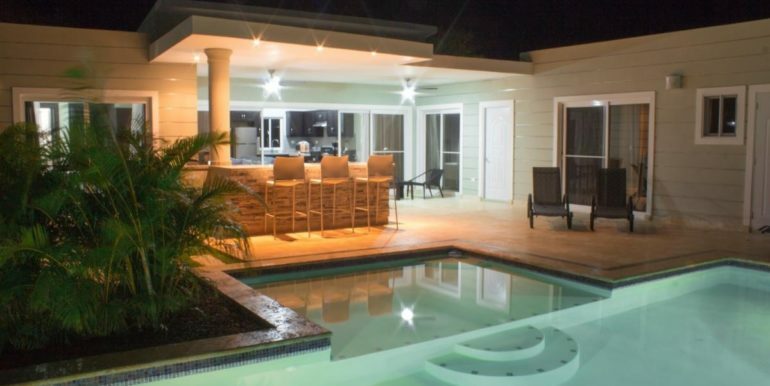 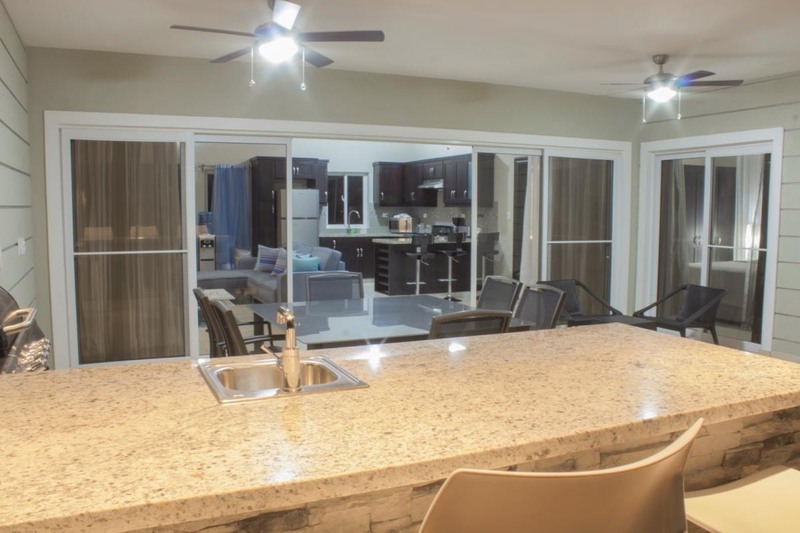 For this vacation lodging, the perks come in bulk: maid service, cable TV, WiFi, back up power generator, 24 hr security, pool maintenance, gardening, and concierge. 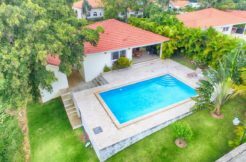 The villa is located in a gated community 5 minutes from Sosua Beach, and on the way to attractions like the Monkey Jungle in El Choco. 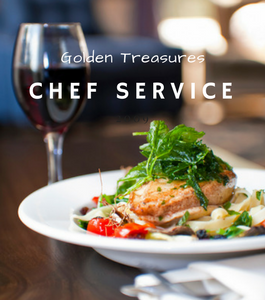 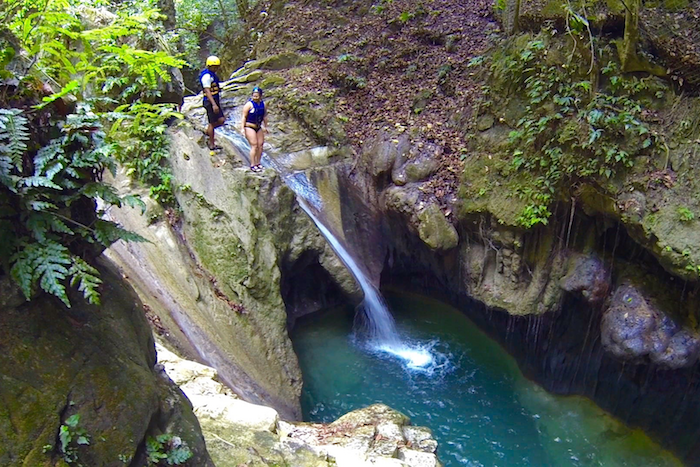 Private driver with van, pro chef and Sosua yacht tours can be arranged with the GT concierge. 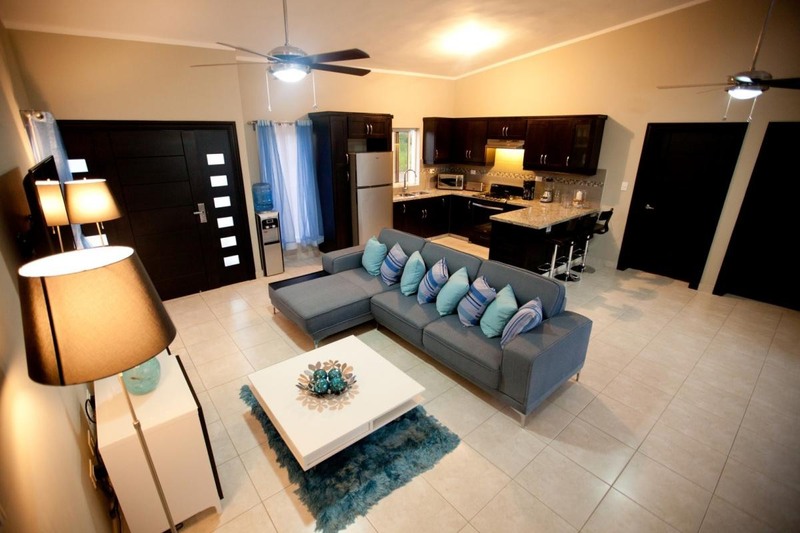 Please see attached rental terms in pdf in this page. 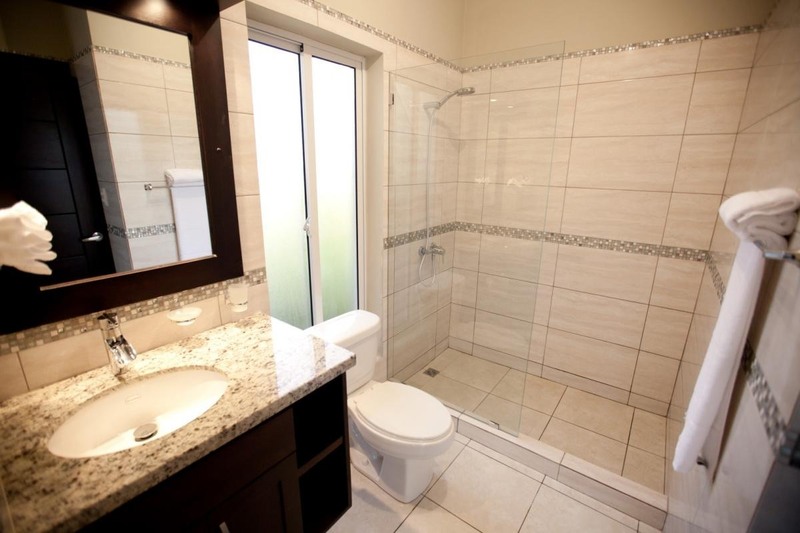 Property Ref # SPC1510-843.